It seems like most people I know have extremely divergent opinions on mushrooms. A few times a year we’ll have a bunch of pizzas delivered at work. People walk up to each pie and when they get to the one with mushrooms it’s either “Oooh, mushrooms!” and they take a slice or they physically recoil away from it and run to the relative safety of pepperoni. That’s cause mushrooms are the Devil’s candy. When the Messiah “Chef Boyardee” returns there will be an epic battle between mushrooms and pepperoni. All others who follow the way of the Anchovies or the Hasidic faith of olives will be left to re-evaluate their faith’s in limbo. Praise be to Pepperoni! A-chef! 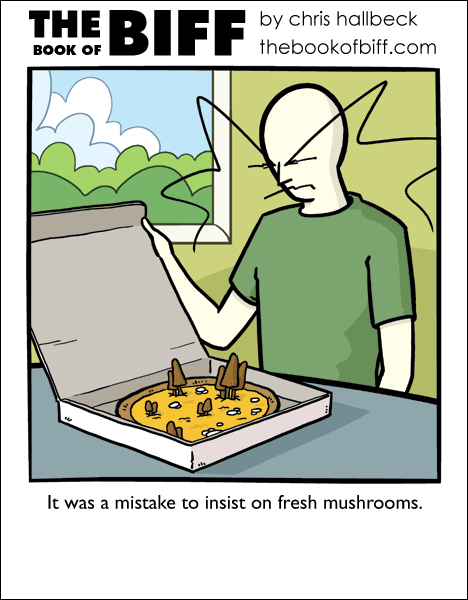 I hate mushrooms, but not so much that I can’t pick them off and enjoy the pizza anyway. I’ll eat mushrooms as a once-in-awhile kinda thing, and I do prefer them fresh instead of canned. Given the choice between the two, however, I would go for pepperoni or even italian sausage first. What I will absolutely NOT eat are onions. Just don’t like the way they feel when I bite down on ’em. Man, pepperoni is blandsville, mushrooms and anchovies are where the flavor’s at. However, mushrooms are one food you should definetely not try fresh, unless you like to gamble. You are a fool, WillElMagnifico! My Mushroom Legions will devour the earth, for we thrive on the death and decomposition of your processed beef snacks! CHEESE AND MUSHROOMS TILL THE END!!! I avoid mushrooms, but only because I get literally nausious when I have them in my mouth, I find it very difficult to swallow. If I can’t enjoy a food, why eat it? i love mushrooms. especially on pizza. my 2 year old loves them already. pepperoni is blandsville? mushrooms have no flavor whatsoever. pepperoni, on the other hand, has a flavor, and it’s great. can’t really comment on anchovies, though. never had ’em. as far as taking over the world and thriving on death and decay, i’m more worried about a zombie apocalypse than a ‘shroom revolution. nothing against ’em, but i really don’t see them being a threat. I have a fued with mushrooms. ‘Destroying Angel’ is too cool a name for any plant. I for one like both pepperoni and mushrooms. Can’t we all just… Get along? Does peperoni makes you see bright colours, pink elephants, fairy and gnomes? Still, I like mushrooms… And pepperoni. But Anchovies rule all! 😀 The Anchovy King shall chastize all the heretics and followers of lesser ways, and all shall bask in the glory of pungent salty fish filets! I have an extremely….odd, divergent taste for mushrooms to say the least. Absolutely fresh ones I’ve a limited taste for, I like canned ones, I like them limited on pizza once in a rare while and the place where they truly belong, according to my palate, in endless amounts is in spaghetti. Cream of mushroom soup? I’ll take one look at it and barf. No kidding. The look and the smell of that adulterated liquid triggers my nausea like nothing else. I like both pepperoni and mushrooms on my pizza. I also like black olives. Since most of the people I know don’t seem to like them, ordering them is a great way to keep people from stealing my pizza. I don’t like both. No meat? Not neat! gammon, salami, pepperoni sausage pieces. That’s my share of heaven. Peppernchinis )Not entirely sure wos to spell that), Black olives, Pineapples, Halepeños, and Anchovies. Lots and lots of anchovies. Interesting side note: I’ve actually eaten anchovies from the tin before. They were delicious. Mushroom pizza is my favorite. On occasion, I will have a Hawaiian pizza WITH mushrooms. -Embrace the fungus! I make my own pizzas with grape tomato slices, crumbled turkey loaf, sliced shallots, sliced mushrooms, pepperoni on a bed of spinach smothered with cheese. @Felix – good thing mushrooms aren’t a plant then, huh? Pfft, you guys and your ancient, outdated faith… Italian Sausage is the faith of reason! 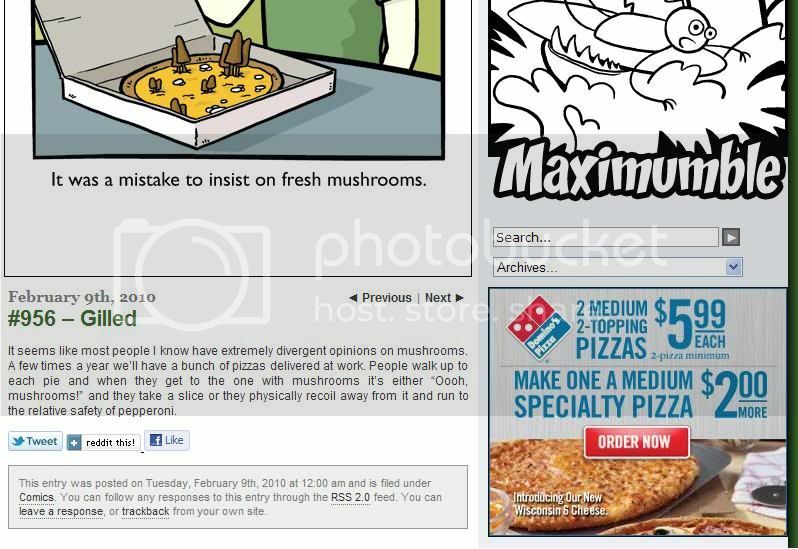 Aren’t the mushrooms on Biff’s pizza magic? They look so. I would highly recommend against eating that pie….. I wish that I liked olives so that I could enjoy supreme pizzas without having to disect them. I also wish that I didn’t find anchovies as repulsive as I do, just because I think it’d be cool to honestly say I liked them. One word: mycophobia. Mushrooms are terrible, and I only flee to pepperoni after burning the corrupt pie with fire. Oh, pie, why did you lie? Mushrooms aren’t food. They are what my food eats. I reside happily at the top of the food chain, baby! I’d be more likely to recoil but if it’s the only pizza there I won’t complain. i think that, if i was going to join a pizza topping based faith, i’d join zaffa’s. My favorite pizza has the ordinary margharita toppings, then: mushrooms, pepperoni and extra mozzarella. See, I subscribe to both faiths! Blasphemer… MAY MY MUSHROOMS SPORE YOUR BRAIN!!! If you are what you eat.. and I LOVE mushrooms… does that make me a fun guy? On another note, there’s a place near me that after the 3rd topping all others are free if you order a full price large pizza. So mine always ends up with Italian sausage, onions, garlic, feta, black olives, Mushrooms, ham, and bacon. Great tasting, just don’t breath in someone’s direction after or their face will melt. look atv the advert that decided to appear for this comic! mushrooms have the texture of mucous and the flavour of gym socks.